It’s good news for those of us Brits who are in the market for a New Nintendo 3DS and also want a bit of Termina to take home. The elusive Skull Kid figurine will be available in the UK in select numbers as part of bundle with the new console. 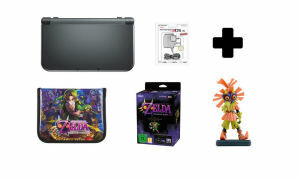 Nintendo have announced a range of different Majora’s Mask 3D themed bundles on their UK store, most of which include the Skull Kid figurine. They are sure to sell out very quickly, so be sure to place your pre-orders soon. As of now, only the limited edition Majora’s Mask 3DS Console has sold out, but the rest of the bundles are still available. Make the jump to see a breakdown of all the bundles that include the Skull Kid Figurine.